THE FORMER GOVERNOR of Mountjoy Prison has said he believes that the cuts to unemployment benefit for people under the age of 26, announced in the Budget last week, could push more young people into crime. In an interview with TheJournal.ie, John Lonergan said there was “nothing positive about it, contrary to government spin that this is about training”. Lonergan said that the cut was also “a terrible indication of the value we place on them, almost blaming them for the predicament they’re in”. Most young people aspire to be able to be self-sufficient, it’s a huge psychological boost to a person to have a job. But the jobs are simply not there, the reality is we’re a million miles away from full employment. The former prison governor said that 95 per cent of those who end up in difficulty with the law come from “very disadvantaged areas, broken families and all kinds of social and family issues”. 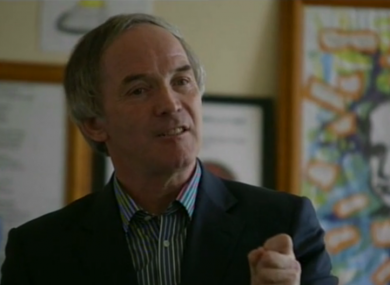 Lonergan affirmed that there is an obvious connection between mental health and criminality and when it comes to young offenders he is “convinced that early intervention is prevention – early intervention is prevention – and in terms of strategy, it’s the cheapest in the long-term”. Resources and facilities for young people, even for children, are limited in some areas and the mental health facilities for 16 to 18-year-olds are very scarce. One in four of the prisoners in Mountjoy had previously been in-patients so obviously psychology and criminality overlap. Which comes first? In many, mental illness comes first, criminality comes second and if there was intervention, I believe young people would never get to a stage where they would become involved in criminality. He said that while mental health facilities in prisons have improved vastly in the last decade, there is a need for a change in society so that facilities are there for people at the early stages of a problem. “Every single human being faces difficulties where we need the support of others, no human is indestructable, we’re all vulnerable from time to time and life can be very tough on some people,” he added. Lonergan spoke yesterday at the annual general meeting for the mental health organisation GROW. Email “Former Mountjoy governor: Dole cuts likely to push young people into criminality”. Feedback on “Former Mountjoy governor: Dole cuts likely to push young people into criminality”.